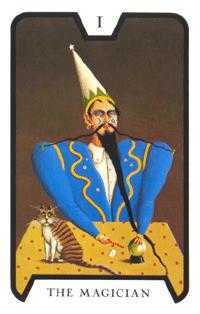 Tarot of the Witches is a popular deck done in the surrealist style, with cards that depict dreamlike fantasies with bold colors and fanciful paintings. Witchcraft is the practice of natural and supernatural acts including evil power. 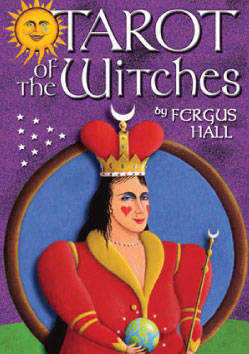 In ancient times, the supernatural power of a witch was not always evil, but often was used for the power of prophecy. One of the most famous ancient witches was the Witch of Endon who lived in Palestine. The Bible tells us that Saul, the first King of the Hebrews, consulted her before the battle with the Philistines. During Tarot card readings, the black witch tends to lean more towards mischievous and evil interpretations. The white witch generally denotes favorable aspects and brightening prospects. 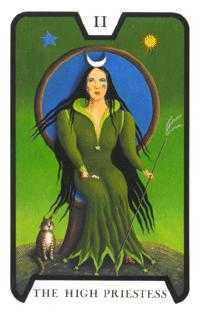 Both types of witches are especially suited to the reading and interpreting of Tarot cards by virtue of their keen perception and concentration. 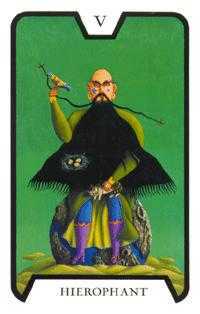 Whether you are an avowed witch or warlock, or simply attracted by the fascination and mysteries of the occult, the reader of Tarot fortune-telling cards soon feels a close kinship to the symbolic pictures. The mystical images depicted on the cards create an association of ideas and symbols which the reader or diviner translates into events, both past and present, including the possibilities which may exist in the future. 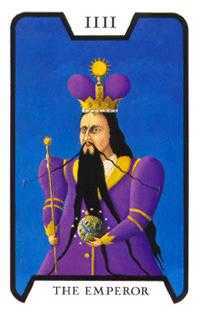 In ancient times the complete coven was similar in number to the fourteen cards found in each suit of the Tarot deck—the pip cards numbered 1 to 10 plus four court cards, the valet, knight, queen and king. Today there are only thirteen cards in each suit of modern playing cards, similar in number to the thirteen persons in most modern covens. The magick circle is the holy place of worship and knowledge. The circle contains within its bounds powerful and compelling forces. When an initiate stands at the threshold of the magick circle it represents the passage of darkness and ignorance into the light of perception, knowledge and wisdom. Inside the magick circle, the north, or magnetic center of the universe, is represented by swords, equivalent to the suit of Swords or Spades. 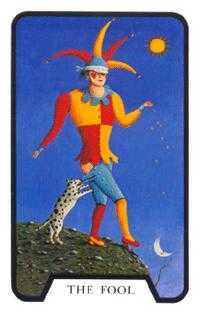 The south side of the Universe signifies struggle and is represented by the suit of Batons, Wands or Clubs. 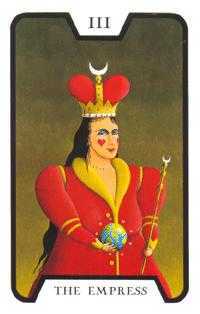 The east side of the universe, symbolic of great knowledge, is represented by the chalice of wine, equivalent to the suit of Cups or Hearts. The west side of the universe signifies meditation, and is represented by paten cakes or coins. It is equivalent to the suit of Coins, Pentacles or Diamonds. The Tarot of the Witches deck, created by artist Fergus Hall and featured in the movie “Live and Let Die,” depicts full length figures in compelling dreamlike imagery making this Tarot pack ideal for coven readings.